Horizon 7 allows you to deliver virtual or hosted desktops and applications through a single platform while providing end users access to all of their virtual desktops, applications and online services through a single digital workspace. Join our 3-part webcast series, Modernize your VDI Environment with Horizon 7 to learn how Horizon 7 provides a streamlined approach to delivering, protecting and managing virtual desktops (VDI) and apps while containing costs and ensuring that end users can work anytime, anywhere, across any device. In episode three we will explore common VDI desktop models. More specifically, we will cover the 4 basic models for VDI desktops and how to choose the one(s) that is right for your organization. Are you planning a migration off Citrix Xenapp or XenDesktop? Or looking for ways to make them run as good as you thought they should? Then this is the session for you. Join us for a technical deep dive on how to evaluate the state of the Citrix environment, assess project requirements and review real world scenarios. By the end of the session you will know all about the best-practices, tools and services available to ensure your project is a complete success. Come learn how VMware technologies can help solve your Citrix problems! Virtual desktop infrastructure (VDI) has seen tremendous growth over the past few years as organizations look to securely and cost-effectively support their ever-increasing mobile workforce. Now VMware is introducing Horizon Cloud, making it easier than ever to deliver on-premises or cloud-hosted virtual desktops and applications from an easy-to-use control plane in the cloud. In this webcast, you’ll learn how your organization can reap the many benefits of virtual desktops and applications with the speed, simplicity, and predictable pricing of a cloud service. Keep your endpoint devices, apps and data securely managed on or off the domain. With VMware unified endpoint management, you’ll remediate vulnerabilities faster, deploy patches instantly and install Win32 software quickly, reliably and consistently. Kevin Strohmeyer, Sr. Director, Product Marketing, Workspace Services, VMware. Q&A with Sashin Sharma. The digital workspace is the defining model for end-user computing in the mobile cloud era, securely delivering anytime, anywhere access to any application to any device including desktops, smartphones, and tablets. This session will provide strategic guidance to the major trends shaping the market and how VMware is delivering the innovation and market leadership across desktop, mobile and cloud infrastructure solutions, making the digital workspace a reality. Today, consumerization is driving Digital Transformation. VMware empowers the Digital Workspace your business needs through consumer simple, enterprise secure solutions. Workspace ONE is the simple and secure enterprise platform that delivers and manages any app on any smartphone, tablet or laptop. By integrating identity management, real-time application delivery, and enterprise mobility management, Workspace ONE engages digital employees, reduces the threat of data leakage, and modernizes traditional IT operations for the Mobile Cloud Era. Join our 3-part webcast series to learn the unique paths to move to Workspace ONE. The need for identity management as the key component to the digital workspace. As new employees join your organization, it is important to get them productive day-one. In this session you will learn how the Workspace ONE suite of mobile productivity apps helps you on-board a new employee with all of their apps and devices in under an hour with 0 tickets and help desk calls. Interest in enterprise wearable technologies and Internet of Things (IoT) devices has been growing rapidly and is expected to continue at a fast pace. Leading companies across a variety of industries see the value in wearable technology – particularly smart glasses and smart watches – can deliver in terms of speeding manufacturing, improving collaboration, achieving greater operational efficiency, and increased productivity. Join us to learn more about the role of wearables and things in the enterprise, key considerations when piloting such devices, and how the VMware AirWatch Unified Endpoint Management (UEM) platform enables management and security from one central console. Take a deeper look into how AirWatch enables Windows management to evolve from a rigid PC-centric approach to one offering a flexible and over-the-air configuration model. This session will delve into the specific configuration, security and OS patch management technologies that AirWatch introduces, as well as leveraging AirWatch alongside conventional Windows management tools that are in use today. • Refresh or upgrade your existing deployments? • Migrate your physical endpoints to VDI? • Extend published remote apps to your Windows endpoints? We look at these use cases and introduce SysTrack - a tool that provides recommendations on an optimal Windows 10 deployment approach your organizations should take. Join Sumit Dhawan, SVP & GM, End User Computing (EUC) VMware, as he delivers the 2017 vision and strategy addressing key market trends of mobility, cloud and the move to Windows 10. Learn about the latest announcements in the Horizon portfolio and how these come together to drive a consumer simple, enterprise secure digital workspace experience that enables organizations to transform the way work gets done. Prakash Kota, VP IT of Autodesk will join Sumit to discuss the organization’s plans to be an early adopter of the digital workspace, and the improvements and enablement they hope to achieve from implementing VMware Workspace ONE™. Horizon 7 just launched into the market and provides you with a ton of new features designed to better secure, manage and scale virtual desktops and published apps with unprecedented speed and simplicity. Join this session to see the product in action and learn about just-in-time desktops with instant clone technology, our new smart policies for truly contextual computing, our new platform for app management and delivery and all of the enhancements we've made to optimize user experience--including adding a brand new feature-rich protocol. With consumer experiences setting the bar for enterprise workflows, mobile app experiences are being redesigned to improve user productivity during mobile micro-moments. A digital workspace must provide enterprise productivity tools without compromising security, usability or privacy. The VMware Workspace ONE Apps Suite provides a seamless and integrated app experience, giving users instant access to corporate email, calendar, contacts, files, browser, social and chat. Discover how to boost users’ mobile productivity while upholding security and compliance standards. The digital workspace is the result of tectonic shifts in end-user computing. From the diversity of devices and applications in use, to the end-users who use them, the digital workspace , with Identity at the center empowers end-users to be productive and access any app, from any device, anywhere. In this session, we'll cover the Identity capabilities in Workspace ONE that provide end-users with secure access to apps with a one-touch single sign-on experience from personal and corporate managed devices. We will also review how it empowers IT to ensure security and control by through fine-grained controls that can limit and/or block from access from non-compliant devices. Horizon 7 allows you to deliver virtual or hosted desktops and applications through a single platform while providing end users access to all of their virtual desktops, applications and online services through a single digital workspace. 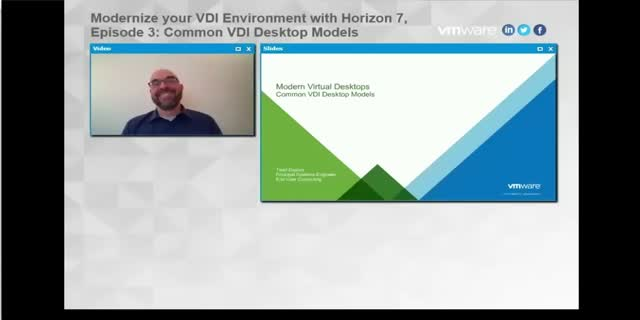 Join our 3-part webcast series, Modernize your VDI Environment with Horizon 7 to learn how Horizon 7 provides a streamlined approach to delivering, protecting and managing virtual desktops (VDI) and apps while containing costs and ensuring that end users can work anytime, anywhere, across any device. In episode two we will deep dive into managing apps and data in VDI. More specifically, you will learn how the tools included with Horizon can help you manage the important contents of your desktops. Horizon 7 allows you to deliver virtual or hosted desktops and applications through a single platform while providing end users access to all of their virtual desktops, applications and online services through a single digital workspace. Join our 3-part webcast series, Modernize your VDI Environment with Horizon 7 to learn how Horizon 7 provides a streamlined approach to delivering, protecting and managing virtual desktops (VDI) and apps while containing costs and ensuring that end users can work anytime, anywhere, across any device. In episode one we will deep dive into user segmentation, provisioning and delivery tools within your Horizon environment. More specifically, we'll identify the different user groups inside your organization and collect the data you need to be successful as well as examine the options for creating virtual desktops and understand how each applies to different use cases. The rapid adoption of new modern applications (SaaS apps, mobile apps) coupled with the proliferation of powerful yet affordable mobile devices has introduced new challenges in the work environment. In order to be productive whenever and wherever, employees have gone around traditional rigid policies. Organizations are facing a critical inflection point to either ignore these trends at the peril of unintended security breaches or to embrace a new way of working leveraging a new management framework. Consumerisation of the enterprise represents both a challenge and an opportunity for IT. Implementing a Digital Workspace can help IT harness the rapid changes brought about by consumerisation and address the needs of the wide range of use cases and workforce profiles within the business. VMware provides a digital workspace platform that enables IT to simply and securely deliver and manage any app on any device by integrating access control, application management and multi-platform endpoint management. Subscribe to this channel to learn more about strategies around end user computing, including delivering a digital workspace, simplifying app and access management, unified endpoint management, desktop and app virtualization, and more from experts at VMware.